A rounded blend of protein, fats, and carbohydrates for a complete vegan meal replacement formula! 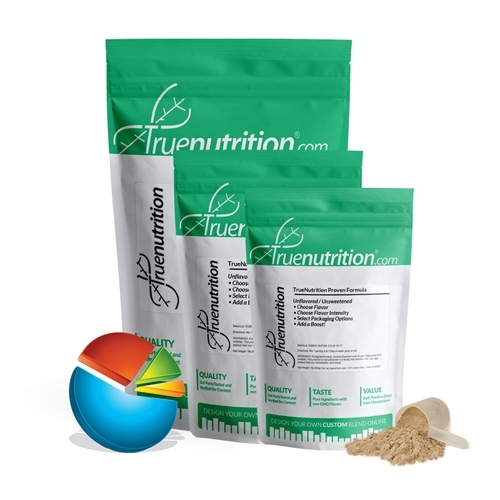 True Nutrition proudly presents our signature Vegan Meal Replacement Formula, a unique blend of plant-based protein, fats, and carbohydrates that have been combined to provide a complete vegan meal replacement formula! When paired with a rounded diet and exercise routine, the Vegan Meal Replacement Formula is intended to take the place of a standard whole foods meal. Providing 19g of protein, 3g of carbohydrates, and 5g of fats for a rounded meal replacement shake! Uses: Meal Replacement: Provides 19g of protein, 3g of carbohydrates, and 5g of fats for a rounded meal replacement shake! Taste: Mild earthy taste that goes great with any flavor! Mix 1 Serving (About 1 Scoop) 1-3 times daily (or as needed) in 8-12floz of water, juice, or milk. Stir or shake and enjoy! Pea Protein Isolate, Rice Protein Concentrate, Avocado Oil Powder (Avocado Oil, Maltodextrin), Virgin Olive Oil Powder (Virgin Olive Oil, Maltodextrin), Hemp Protein. re-ordering this for the 3rd time. Hands down this is the best meal replacement you can get. the numbe rone reason is because it contains ZERO SOY. Soy protein is the worst thing for a guy, especially if you're on the vegan kick. Product keeps you feeling filled and satisfied.